Today’s blog post is an exercise in using every last bit of the food we have and making it into something delicious. At a recent orchard visit, we received a free 4-pound pumpkin. The small pumpkin, only about 8 inches tall, looked very cute and festive on the countertop. But why stop there? While opening the pumpkin to extract the seeds, the thought hit Stacey: “Figure out how the make something out of the entire gourd!” So this week’s post is a two-part recipe. First, the seeds. Man, are they slippery! Once you’ve hacked your way into the pumpkin – we just chopped it open with a chef’s knife – remove the seeds and put them in a colander. Rinse them, removing the orange “gunge” that will try its best to thwart your cleaning efforts. Lay the wet seeds on a dry paper towel in one layer and pat them dry with another paper towel. At this point, we divided the clean and dry seeds into three bowls. To each bowl, we added several drops of extra virgin olive oil, enough to coat the seeds. That oily coating will help the seasoning stick to them. Then we seasoned one bowl with kosher salt, another with a sugar/pumpkin pie spice mix and the final bowl of seeds was seasoned with Old Bay. Season each one to taste; there are no right or wrong measurements here. Lightly spritz foil-covered baking sheets with cooking spray and spread seasoned pumpkin seeds across the sheet in one layer. With the oven at 300 degrees Fahrenheit, roast the pumpkin seeds in 10-minute intervals for about 30 to 40 minutes until lightly browned and crunchy. Cool and store in an airtight container for about a week. While the seeds are drying on the paper towels, chop the pumpkin into 1-inch chunks. Place them on a lightly oiled baking sheet and brush with a little more oil and sprinkle with salt, if desired. Put the sheet in the bottom of the 300-degree oven and roast the pumpkin pieces for about 30 to 40 minutes until they are very soft when poked with a knife. Remove from oven and scrape the meat from the rind. We discarded the rind, put the meat into a pot and used our butternut squash soup recipe as a template to make pumpkin soup. Making use of the entire pumpkin is an ideal example of minimizing waste and using what we have – a powerful lesson in this day of convenience. There are health benefits to this process as well. If we’re interested in making use of the entire pumpkin, we’re enjoying the full tastes and nutritional value of the product. The flesh of the pumpkin is rich in beta carotene, while the seeds are a good source of protein and several minerals including iron and magnesium. The seeds can be stored and used for other purposes, such as topping soups or salads, or mixed in with nuts for a crunchy snack. 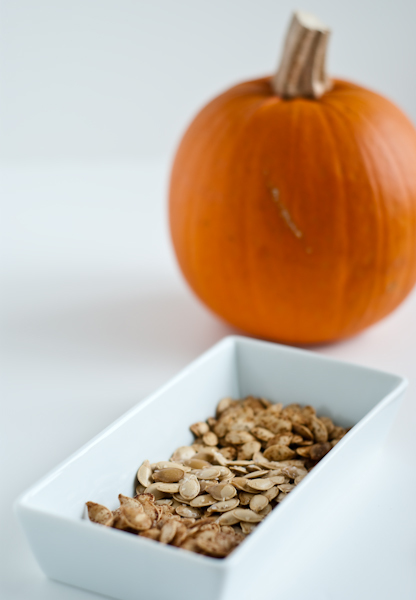 How do you flavor your pumpkin seeds? How would you cook the pumpkin flesh if not in a soup? How Stacey Got the Shot: With natural light, foam core and a silver reflector. ISO 100, the 50mm f/1.8 lens at f/2.5, 1/80 second exposure. We made pumpkin seeds recently too. We did half with kosher salt and the other half with freshly grated nutmeg, cloves, and cinnamon. As far as the pumpkin flesh goes, we peeled and cubed ours, then roasted it in the oven with more nutmeg, cloves, and cinnamon. We cooked up a big batch of steel-cut oatmeal and ate it with bits of the pumpkin all week. We also made a curry with cubes of sauteed pumpkin, but we weren’t crazy about it. We’ll have to try again some other time! A Bajan friend taught me to make pumpkin fritters – simply shred the flesh, mix with eggs, flour, salt & pepper and fry them. Delish! Thank you for your delightful comments! Nicole and Rosy – those recipes sound delicious. Thanks for sharing with our readers. Happy Halloween! Take the roasted pumpkin and mix it with drained, canned crushed pineapple. Spread in a 9×12 casserole dish and sprinkle with nutmeg. Place in a 350′ oven and bake until warmed through. Then cover the top generously with meringue, making sure to seal the edges so it doesn’t shrink, and bake until browned. This is a most beautiful and delicious side dish for Thanksgiving!! everyfoodfits.com » Aren’t you GOURD it’s autumn?